[UPDATE for 2018: Fifty years ago this summer, the four original members of Led Zeppelin, led by former Yardbirds guitarist Jimmy Page, first got together in London. The band's first UK tour, in the fall of 1968, included a November 9 show at London's Roundhouse on the very day the Beatles' eponymous "white" album was released; undoubtedly a good omen for a young band that was on the brink of behometh stardom itself. But sorry, Led Zep fans. The likelihood of a band reunion this year—or any year—is pretty much nil. Since the group's last resurrection in 2007, Robert Plant has vigorously expressed his absolute disinterest in revisiting the past, preferring forward momentum. "For me, my time has got to be filled with joy and endeavor and humor and power and absolute self-satisfaction," he told Esquire in February 2018. "That’s not with Led Zeppelin. That’s doing what I’m doing right now, with this band, on this tour." Plant released his impressive 11th solo album, Carry Fire, last fall and he will be touring the world for much of this year with the Sensational Space Shifters, which includes another New York stop at Forest Hills Stadium on June 13 with Sheryl Crow. (But Plant does slip in some some reworked Zep classics into his sets, like "Whole Lotta Love" and "Misty Mountain Hop.") Plant also chatted about the album for an FUV Live conversation last autumn. However, there are special events that will mark Led Zep's anniversary with a full battery of music and memorabilia, like the March 7 concert at Carnegie Hall, "The Music of Led Zeppelin." The show, produced by Michael Dorf and benefitting music education for underprivileged children, will feature J Mascis, O.A.R., the Zombies, Bettye LaVette, Erika Wennerstrom, Nicole Atkins, Living Colour, Son Little and many others with their interpretations of Zep classics. A brand new illustrated Led Zeppelin book is also in the works for publication in October, a 368-page compilation of photos and text will include new content from surviving members Plant, Page and John Paul Jones. And for Record Store Day on April 21, a 7-inch single of previously unheard studio mixes of "Rock and Roll" and "Friends," produced by Page, will be released. In addition, a super deluxe remastered version of How the West Was Won, a live album of the band's 1972 Los Angeles and Long Beach, California concerts, is set for a March 23 release. Page, the determined keeper of the Led Zep flame, has also hinted at more unreleased mixes or music seeing the light of day this year. A tour de force of testosterone, galvinized by deep, almost scholarly appreciation of the blues, Led Zeppelin was a supernova of a band that emerged in 1968, conquered the '70s, and then folded in 1980. The group existed for just a dozen years, officially three years longer than the Beatles' nine-year juggernaut, but like their forebears, Led Zeppelin drew up a rock 'n' roll blueprint for generations of musicians to follow. The quartet — singer Robert Plant, guitarist Jimmy Page, bassist and keyboardist John Paul Jones and drummer (and force of nature) John "Bonzo" Bonham — built heavy, complex rock songs that were muscular and lusty, but also musically sophisticated. It was a tricky feat, but the band pulled it off with masterful prowess, from its assured, self-titled debut in 1969 to its true final bow, 1979's In Through the Out Door (1982's Coda, which came out two years after the band's demise, was a collection of unreleased recordings). The foursome's keen, vituosic musicianship was paramount: the swagger and bravado of Plant (one of the best rock vocalists to ever wail into a microphone), Page (Zep's engine and an undisputed guitar hero), Jones (an underestimated master) and Bonzo (arguably the most powerful drummer to ever smash a pair of sticks) coalesced into a tight unit, swiftly elevated by the music press as hedonistic rock and roll gods. To this day, not many bands can command a stage (or a studio) quite like Led Zeppelin did. 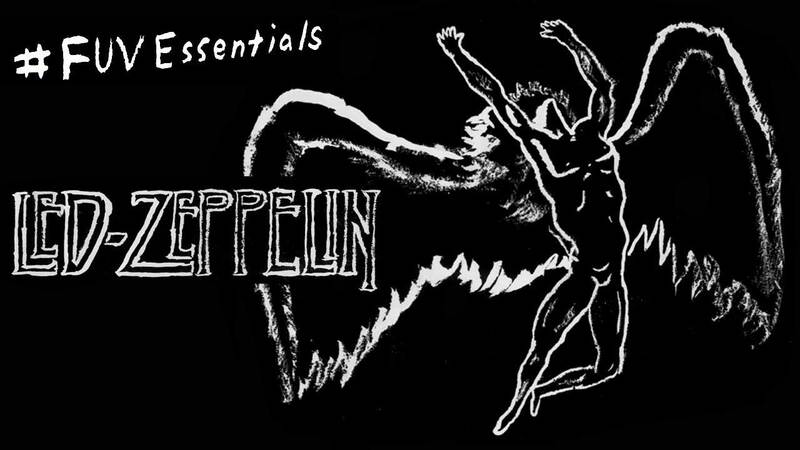 But beyond their reputation as a thunderous hard rock band, Led Zeppelin wrote beautiful, fragile melodies too, like the Joni Mitchell-inspired "Going to California," the labyrinthine "Kashmir," the delicate, Irish latticework of "Black Mountain Side," and even that epic, sometimes-litigious warhorse "Stairway to Heaven." Yes, Led Zeppelin was an iconic hard rock band, but they were also steeped in folk, blues, pop, and world music. Their songs, brilliantly produced, are often visceral, unpredictable journeys: the trajectory of the temperamental and gorgeous "Over the Hills and Far Away," from Houses of the Holy, is akin to gamboling down a grassy, Welsh mountain path — all chiming acoustic guitar, Tolkien metaphors, and lyrical bluebells — and then turning a sharp corner and falling into the gaping mouth of an erupting volcano. By the end, wrung out by the Plant's anguished howl, Bonzo's turbulent drumming, Jones's chugging bass, and Page's lava-hot slash of a guitar solo, the song gently eases to a murmur, sweetly beckoning the listener home. It's an astonishing five minutes. There are few bands, from Foo Fighters to Queens of the Stone Age to the Yeah Yeah Yeahs, that don't owe some debt to Led Zep. Like any band with too-few albums — just nine studio releases, including Coda — their songs have been played so much on classic rock formats that some standards, like the orgasmic (and also litigious) "Whole Lotta Love," can be hard to hear with fresh ears. Rediscovering Led Zeppelin — and appreciating the quartet's transcendent genius — likely falls to another generation, less saturated with their songs. On September 16, 2016, a revamped collection of recordings surfaces via the reissued The Complete BBC Sessions, including eight "new" songs, like 1969's "Sunshine Woman," a song which Page told Mojo was "basically made up on the spot." Likely no other band has been cajoled to reform as much as Zep (and half of that dialogue seems to be between an eager Page and the ever-reluctant Plant), but unless devout Zep fans were lucky enough to catch the band at London's O2 Arena in December 2007 for the Ahmet Ertegun Tribute concert, it's wise to abandon all hope for that improbable dream. Aside from seeing the band's surviving members tearfully and joyfully react to Ann and Nancy Wilson's 2012 Kennedy Center Honors cover of "Stairway to Heaven," or wandering out of a courtroom, there's little chance, it seems, to experience Plant, Page and Jones playing live together again as Led Zeppelin. Had Bonham not died in 1980, a seismic shock which led to the band's dissolution, would Led Zeppelin have continued? Possibly not. Plant, having suffered the tragic loss of his son in 1977, was already looking beyond the boundaries of the band. His restless ears have led him down an expansive solo road that has recently included his Americana classic with Alison Krauss, 2007's Raising Sand (which won a Grammy for Album of the Year), his exploration of desert blues with current bandmate Justin Adams, and his spellbinding 2014 album of heartache and homesickness, Lullaby and ... The Ceaseless Roar. As Plant looks ahead, Page continues to be Led Zeppelin's chief historian with almost wistful dedication. Since the band's demise, Page has ricocheted from collaborations with The Firm, Black Crowes, and David Coverdale, and has worked with his former bandmates too: Page and Plant collaborated on at least six post-Zep albums, including 1995's No Quarter Unledded, and he worked with Jones on 2000's Lovin' Up a Storm and Rock and Roll Highway. But perhaps the worst thing to ever happen to Led Zeppelin was consultant-driven classic rock radio. The repetition of a mere handful of songs, played repeatedly until neutered of their sensual thrill, restricted the full scope of Led Zeppelin's impact and artistry. And so we're resurrecting the great Led Zeppelin — and Robert Plant, Jimmy Page, John Paul Jones and John Bonham — as FUV Essentials.